A cracking 15 1/2 lb salmon from Lake Paringa. Photograph courtesy of Lake Paringa Lodge. Lake Paringa sits amid thick native bush in a very isolated part of the South Island’s West Coast. Dense undergrowth surrounds the lake to such an extent that shore fishing is practically impossible around most of its shoreline. Rain passes through the thick vegetation and stains the water tea coloured, typical of West Coast lakes. Anglers must also be careful when wading around the shoreline to avoid sudden drop-offs which can be difficult to see in the dark water. Much of the shoreline is also swampy and you can feel your boots sinking in the muddy bottom. The only area that can really be accessed by anglers fishing on foot is near the Jamie Creek campground. There is a small Department of Conservation camp site located at the mouth of Jamie Creek on the eastern side of the lake just off State Highway 6. The facilities a pretty basic, just a toilet, but the cost is only $6.00 a night per adult. No booking is necessary. Insect repellent is a must if you are to avoid being bitten by sand flies. 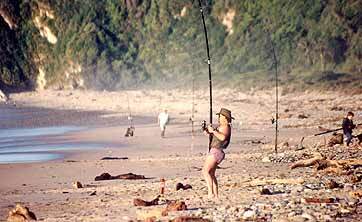 Most fish are taken from Lake Paringa by anglers trolling from boats. Kayak fishing has increased in popularity and Lake Paringa suits this form of fishing well, allowing the angler to fish the otherwise difficult to access shoreline. 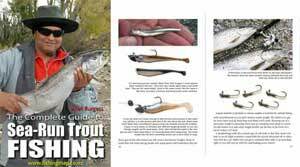 Peter Shutt, in his excellent book Fishing in the South Island New Zealand, suggests trolling or spinning with a black and gold zed spinner. This is always a good choice when there is poor water visibility. Another good lure to try is a black and gold Tasmanian Devil. According to West Coast, Fish and Game Lake Paringa is well stocked with brown trout weighing between 1 – 2kg. There are also larger “black water” brownies caught occasionally. The shallow lake margins, where foot access is possible, are well suited to wet fly fishing with, according to West Coast Fish & Game, a size 6 or 8 Mrs Simpson, or similar. Dry fly fishing is also excellent when the surface is calm, particularly morning and evening. Small bullies are the primary food source for trout in the lake so a soft-bait bully imitation fished on light spinning gear is well worth a try. Great looking fish from Lake Paringa. Photograph courtesy of Lake Paringa Lodge. Quinnat salmon run into Lake Paringa from the sea entering through the Hall River, which runs off the Paringa River, from January onwards peaking between March and May. The salmon spawn in the Windbag Creek. Like the trout, most salmon are taken by anglers trolling from boats with most being caught off the mouth of the Windbag Stream. Lead lines, or downriggers, are the best option for boat anglers after the sea-run salmon in deeper water. Spin fishing for them from a dinghy or kayak should also be effective provided you give your lure plenty of time to sink down to the fish before winding. White or silver lures are best for the salmon but a darker colour might be more effective should the water be dirty following heavy rain. Lake Paringa is a magnificent place set in the wilderness of South Westland. It is one of life’s great pleasures just to be there. Catching a fish makes it even better. 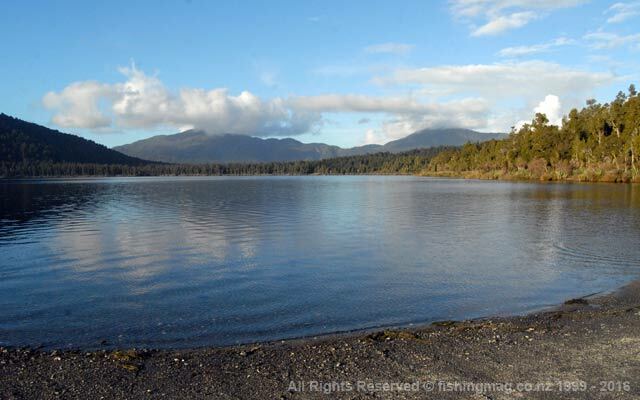 In the video’s below you can see just how difficult, if not impossible, shore based trout fishing is at Lake Paringa other than close to the Jamie Creek campground. Lake Paringa, South Westland. View from Department of Conservation campsite. Photograph Allan Burgess. 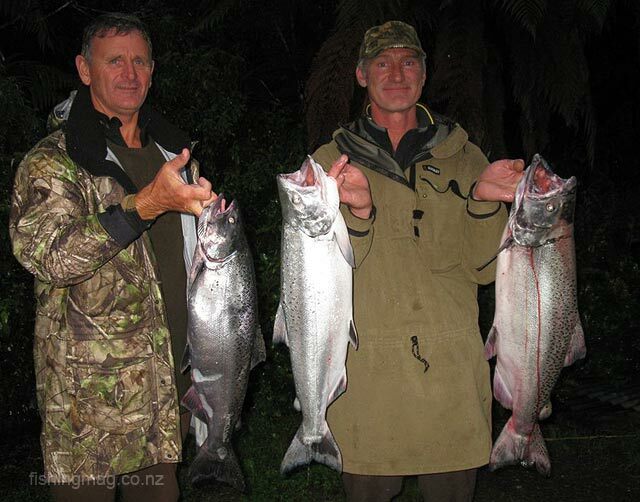 Open Season for salmon in Lake Paringa (including the Windbag Stream) 1-October to 31 March. The Open Season for trout fishing in Lake Paringa is all year. Fly, Spin and bait fishing are all permitted in Lake Paringa. The daily bag limit for Lake Paringa, no licence holder shall on any day take, kill, or be in possession of more than 4 brown trout, 2 rainbow trout, or two salmon. 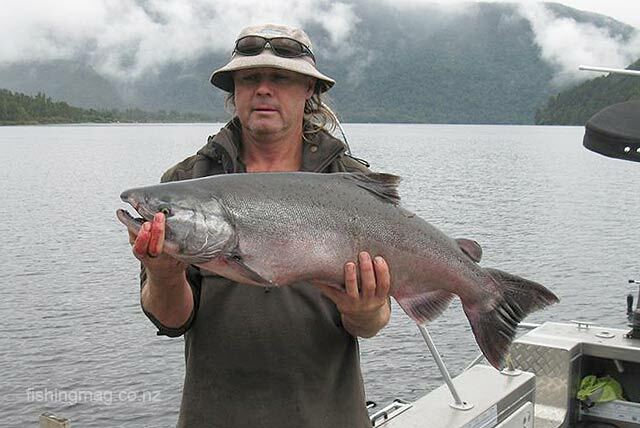 The minimum length for trout and salmon in Lake Paringa is 250mm. 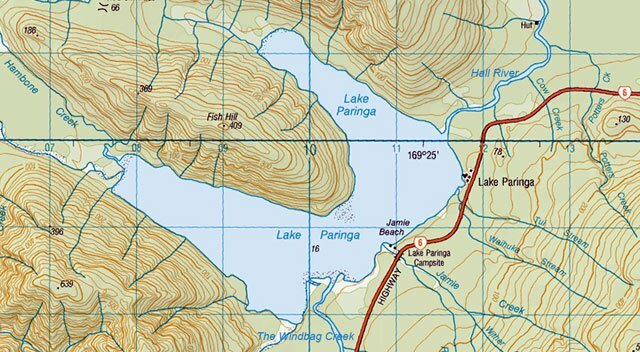 Lake Paringa Lodge is right beside the lake. In 2011 there were 5,000 salmon fingerlings released into Lake Paringa. The young salmon were reared by Pacific Salmon in the Malborough Sounds and originally come from wild, Lake Paringa stock. These small salmon weighed 70 grammes, which gives them a good chance of surviving predation and returning over the next three seasons. West Coast Fish & Game do a great job stocking Lake Paringa and are to be commended for their efforts. 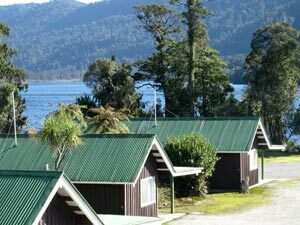 Lake Paringa Lodge, Affordable accommodation for travellers. Motel, backpackers and van sites. 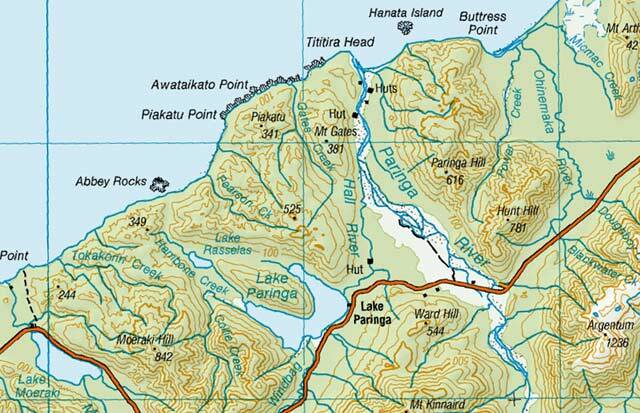 Located 68 km south of Fox Glacier and 50 Km north of Haast. For forward bookings, contact Nathan phone 037510894. Lake Paringa Westland, South-Island of New Zealand. Salmon swim up the Paringa River, then into the Hall River to reach Lake Paringa, to spawn in the Windbag Creek. Map LINZ Crown Copyright Reserved. Lake Paringa Westland, South-Island of New Zealand. Map LINZ Crown Copyright Reserved. In this short video you can see the dense bush which falls to the water’s edge making boat fishing the best option at Lake Paringa. Below: Magical scenery, with perfect conditions, heading through the Hall River to Lake Paringa, West Coast, South Island, New Zealand. It does not get ANY better than this! Shore fishing looks to be impossible.